This 72" plate bolts on the regular seeder tool bar and allows you to bolt on multiple seeders, up to 5. The continuous bolt holes on the plate allow you choose your precise spacing. Adjustable seed plates to accommodate a variety of seed sizes. Designed for breaking up soil and tearing out weeds. The harrows are easily adjustable. Break up hard soil from compaction by rear tire. Typically used with another belly implement (cultivator, hiller-bedder). Chisel plow designed to break up hard soil. 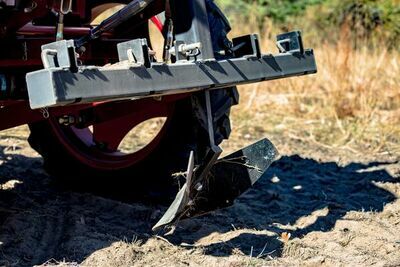 The purpose of a turning plow, or moldboard plow, is to bring fallow land back into production. It acts as primary tillage for land that has not been cultivated by burying plant residue and loosening soil. The Transplanter (Plant Setter) pulls behind tractor and opens a furrow for plants to be dropped into furrow by rider, and closed again. 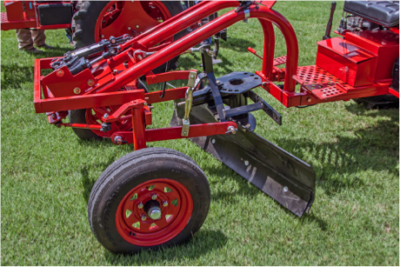 The middle buster is designed for breaking hardpan earth and plowing up root. It’s perfect for potatoes. Designed for moving topsoil; grading, leveling, removing snow and gravel. The angle is adjustable by the drop in pin located at the top of the implement. The top link can also be used to adjust the vertical angle of the blade.